Snapshots from the Middle East: Ours vs the rest! ‘Bakrid’ is round the corner and like last year the ‘bakri’ (goat in Hindi) is back at the villa next door. I wince every time I hear it bleat and thank my stars we have a road that separates our house from theirs. I thank my stars even more because they slaughter the poor animal in the driveway away from the road and our house. The house that flanks the driveway where they make their kill houses Indians, vegetarians most probably. I wonder how they cope with what must be a horrible and gruesome sight. I have known many Muslims in India and quite honestly its only now that I am aware they are Muslims. Back then they were just friends, that they were Muslims hardly registered. Not one of my Muslims friends ever slaughtered a goat in their house. I am sure it is illegal to slaughter at home but even if it was legal I cannot imagine any of my friends picking up an axe or whatever and calmly or gleefully proceeding to kill a terrified and helpless animal. Not a single Muslim friend wears a veil or a burkha. In India, burkha clad women are seen mostly in predominantly Muslims areas that are poor and decrepit. Well educated and affluent Muslims do not wear the veil. And I do not know of a single Muslim in India that has multiple wives. Sure there are Muslims with four wives but almost never from the educated or affluent class. Names like Talal, Hanadi, Suad, Tamim, Haitham, Salwa are all Middle Eastern. I have never come across these names in India. Rafiq is quite a common name in India but in Qatar Rafiq is a derogatory term used to address people lower than oneself in social standing. So is the Indian middle class Muslim different from her counter part in the Middle East? Last week we did not watch TV and so missed what the media described as the story that grabbed the eyeballs of an entire nation – the story of 6 year old Prince in India who fell into a hole about 60 feet deep and 9 inches wide. The ’hole’ was an attempt to dig a well. When no water was found, the hole was carelessly covered with 2 sand bags and left unattended. Happily it’s a story that ended well. Despite having spent a grueling 50 hours in the hole, the child was rescued. Apparently the TV channels went overboard and sensationalized the story. Sensing opportunity for free publicity corporate houses and politicians outdid themselves in promising support for the child. But what really gets to me is that no body is talking about the people that left the hole unattended. Should there not be criminal charges of neglect passed against them? Instead of promising money to little Prince or mouthing the mandatory platitudes, the government would be much better off creating legislation making such irresponsible behavior punishable. My maid, who is from Kundapur, Karnataka,was the one that broke the news about Raj Kumar’s death. She had watched it on ETV Kannada. I caught the news item on NDTV. Raj Kumar, they said, had died at home. He was brought to the Ramiaih Hospital where he was declared dead on arrival. It seemed to me that the report was at great pains to point out that the legend had died at home and not in the hospital. Ramiah Hospital correctly anticipated a rampage – which took place any way - had the icon had died in the hospital (which he probably did!) . This reminded me of my father recounting the day Mahatma Gandhi died. The news on radio emphasized that Gandhi had been shot by a Hindu. This was done, because the Govt. feared Hindu-Muslim riots. The rampage and destruction that followed the death of RajKumar, Kannada actor and icon, is as appalling as it is baffling. Even more shameful is the way Javed’s friends and relatives stormed the hospital in Meerut. Javed succumbed to severe burn injuries sustained when he saved about 7 lives in the Meerut fire tragedy last week. Angered at the refusal of the hospital authorities to let a crowd into the room where doctors were fighting to save Javed’s life and later the death of Javed, provoked the crowd to violence. Who knows how many sick people the hospital turned away even as it struggled to come back to normal? It is time the courts took steps to penalize the mobs. Pictures of people destroying public property should be published and these people should be punished. Severely. 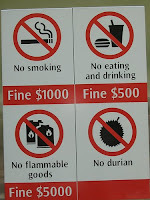 Punishing even a handful will ensure the mob is more careful the next time round. This was amongst the first signboards I saw in Muscat. I was shocked. I never expected to see a Hindu Indian name on a signboard. Not that Asha has any Hindu connotations. Asha means hope but the word has its roots in Sanskrit, the ancient language in which Hindu texts are written. My reference point was Doha where there used to be an Indian restaurant called Ashoka. The word Ashoka has no Hindu connotations either. Having its roots in Sanskrit, Ashoka means free from sorrow. But history speaks of a great Indian king called Ashoka. Circa 3 BC, he ruled over a sizeable portion of South Asia. After a particularly bloodthirsty battle, history says he was so overcome by the death, loss and destruction war entails, Ashoka resolved never to go to war again. He turned to Buddhism and from that time onwards dedicated his reign towards promoting peace and non-violence. He was a great king by any standards. But authorities in Doha took exception to the ‘Hindu’ name of the restaurant and the owners were forced to change it. It was renamed Alshoka and probably still stands on C-Ring Road. 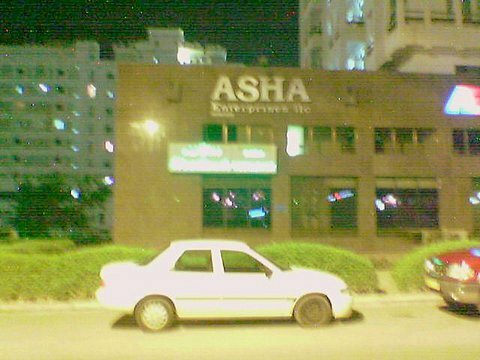 It was against this background that I gaped at the signboard that proudly read Asha Enterprises. That was the first time I tipped my hat to Oman. That’s when I knew we would come to love Oman as if it were our home country. Two comments prompt this post. The first. Chulupu’s comment to a post of mine on the trend of Indian maids converting to Christianity. The second, a comment by my neighbour who is looking for a maid. I recommended Khadija. The neighbour waffled around a bit and finally blurted out - ‘We do a lot of pooja (worship) at home and we would ideally prefer a Hindu to be around our articles of worship but a Christian will do’. The sentiments underlying both the comments are similar, but each comment is from across the fence as it were! The Khimji Mart in Madinat Qaboos (Hay Al Rahba, Muscati!) is doing very well. Particularly the vegetable section which every body says is– ‘as cheap as Lulu’. The Lulu Hypermarket, about 2 years old in Muscat, has then become a benchmark for retail players. 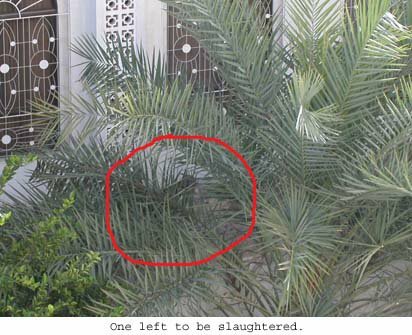 Time was when the only (good) vegetable selection for people in and around Madinat Qaboos and Al Khuwair was Khalijana. The vegetables were (and are) very good but prices high. Many actually preferred the Wadi Kabeer vegetable market since prices there are supposedly very low compared to Khalijana. Even so, Khalijana used to be full of people. Lulu changed all that. Now Khalijana is often empty and what is more prices have fallen. Avowed Wadi Kabeer goers have transferred loyalties to Lulu. With all its faults, Lulu has offered people a good alternative. Shopping in pleasant environs at low prices and within city limits. And it has forced other stores to drop prices and up service. Way to go, Sam Walton would have approved! If you look at the protests against the Mohammed cartoons, they have mostly taken the form of demonstrations – some peaceful, many violent in that they have involved the declaring of malicious intents, throwing of stones, worse molotov cocktails, torching of buildings, flags… and saddest of all - one person died in Afghanistan. The protests in the GCC have been markedly different. Here the protests have been non-violent. They have taken the form of a boycott of products from Denmark and this move has probably hurt Denmark the most. Of all the countries in the world to take exception to the cartoons, I expect the countries in the GCC are offended the most. And yet there has been no violence whatsoever. Commendable. I imagine the Danes in Oman pretty much go about their lives as usual except that they probably downplay their nationality and keep their opinions to themselves. I wonder why the reaction in the GCC has been so different. Is it because the GCC as a people are more mature? They were certainly able to make their objections felt and all this without traffic being disrupted, a single stone being thrown or a building being burnt. Or is it because, living as they do under authoritarian regimes, there is no possibility of demonstrations – peaceful or violent here? The Madinat Qaboos outlet of Khimji’s Mart opened today. On Day One of the opening, the store has tremendous goodwill from the people in and around the area. For one thing there is no other store close by. Omanization put an end to all the small stores that used to operate in the region. Secondly they have a big captive audience in the Hay Al Rahba Complex itself – the store is located on the fringes of this residential complex. Hay Al Rahba houses some 200 flats, 40 townhouses and 40 independent villas. The residents can walk down to the store in less than 5 minutes. Will the store succeed? . Al Fair apparently used to operate a store in the complex many years ago but they shut shop when people did not buy anything other than milk and bread from them. Price the products high and everybody will make a bee line to Lulu. Don’t get the product mix right and people like me will continue to drive all the way to Ruwi to Haridas Nensey for grocery items. And I might even have to continue to stop off at Lulus for my ‘white goods’ – milk, laban and youghurt because Lulu is the only place where I am assured of Al Marai’s skimmed milk. For now however the Khimji’s appear to have a winner on their hands. Wishing them all luck! At Ruwi round about I saw a shop with the name ‘Mother’s Kitchen’. Mother’s food is aspirational. True. But her kitchen? I am not so sure!